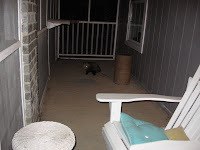 Possum came to visit last night, and looked fat and happy (on the end of the screen porch there). Fat, probably because he's coming in finishing the remains of the feral cat's dinner. Happy, because his little primordial brain has figured out where the food is, and remembers to go there every night to get it. Funny how animals are treated as not so smart, but know quite a bit, really. We have a possum who eats our feral cat's food as well. I caught a peek at it one night last week and that sucker is HUGE! I believe you can tame the critter, Ms Cow. If he's letting you take his picture, he must be starting to trust you. Has he heard your voice? Heather: yes. yes indeedy. large. larger, and largest. At least we know they are finding food in this modern, habitat-destroying world. Dog: (Topiary writing note to always have sufficient dogfood). Check. Gorilla: Topiary has not tried her dulcet tones on possum...he is rather large...but very cute when they use their hands to eat. We could learn a lot from animals. We have possums everywhere. Little ring tail ones in trees and they crawl along the powerlines from tree to house at night. Very cute, until the get in the roof and pee leaving a nice big stain on the ceiling!.